Prepare your box of tissues! John David Anderson, acclaimed author of Sidekicked and Minion, brings readers Ms. Bixby's Last Day, a heartfelt novel about the one teacher you never forget, and the friends who stay by your side no matter what. Everybody knows there are six kinds of teachers in the world. Sixth graders Topher, Steve and Brand know this better than anyone. Some of these teachers include the Zombies, the ones who have been teaching forever. There are the Caff-Adds or Zuzzers, the ones who are constantly on a caffeine-high and speak so fast that nobody understands them. There are the Dungeon Masters, your classic strict teachers who insist on absolutely no talking during break and reading time. And lastly, there are the Good Ones, the ones who simply make enduring seven hours of class slightly more bearable. Ms. Bixby is one of the good ones. So when she unexpectedly announces that she is unable to finish the class, Topher, Steve and Brand set out on a risky quest to give Ms. Bixby the last day she deserves. Ms. Bixby's Last Day was a superb story filled with humor, lovable characters and an unforgettable storyline. I went into this expecting a quirky and fun quick read about three middle-schoolers and their teacher, but what I got from reading Anderson’s story was much, much more. Told from the alternating perspectives of Topher, Steve and Brand, the reader is able to not only grasp the distinctive personalities of each boy, but learn about their individual backstories as well. Topher is the creative geek, Steve is the intelligent nerd and Brand is the boy with the big heart. I fell in love with each character, and came to experience each moment of excitement, laughter and grief alongside Topher, Steve and Brand. Anderson allows each boy to shine in his own way, and Anderson’s exploration of these young boys adds an additional level of honesty to the novel. Not only does Anderson bring his characters to life, but he touches on difficult issues such as loneliness, self-doubt, change, and all the confusing feelings that come with being twelve. I surprisingly found myself reminiscing about the good (and bad) times from my own childhood, while Topher, Steve and Brand provided us with flashbacks and wonderful memories of Ms. Bixby. The book was a perfect blend of nostalgia, comedy and profound emotions. Middle school is often filled with angst, and Anderson artfully captured this complicated, yet innocent time in one’s life. You will cry, you will laugh, but most of all, you will smile. 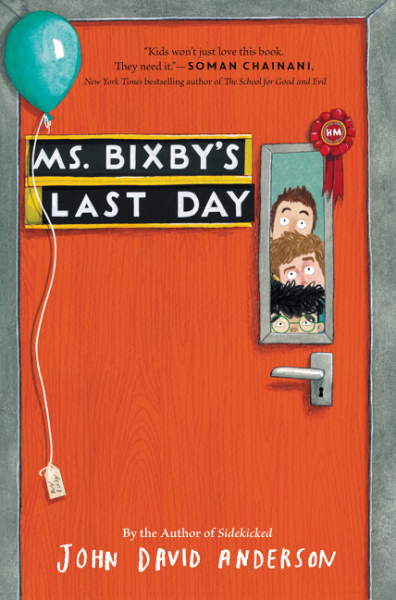 Ms. Bixby's Last Day is a truly captivating story, complete with humorous and lovable characters. Definitely a must-read for both young readers and adults alike.